However, Dr Mbabazi [a risk analyst at the WHO country office; MK] said there are “serious health system and bureaucratic problems” that have led to the re-emergence of polio in the country that need to be fixed “real fast”. He cited bureaucratic delays that stopped the government from responding quickly to the WHO warning. But: there is no money to arrange the logistics of a vaccination campaign. Yet another example of how ignoring health logistics will lead to disastrous consequences. When will we start to integrate logistics in our health planning? 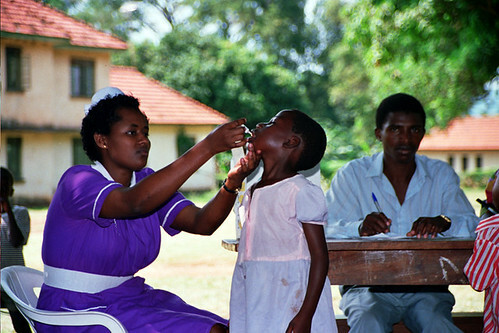 (Photo: Polio immunisation in Jinja, Uganda. Courtesy of Richard Franco. Some rights reserved.